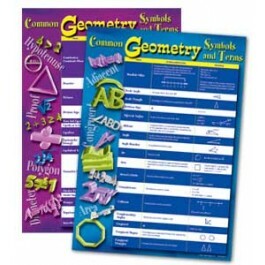 Bright colors and sleek 3-D graphics add pizzazz to geometry symbols and terms! A great student reference for your classroom, this bulletin board set includes (5) 17 x 24 inch charts packed with useful information. 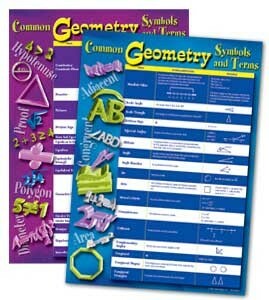 For each geometry term, a clear definition and example are provided, along with any associated symbols or formulas.